Firstly, there is most assuredly life after the :30 for you big television marketers who are freaking in your pants over the so-called death of the :30. Certainly, as Jaffe claims in the book, the :30 in its current incarnation will see a painful death but all is not lost. 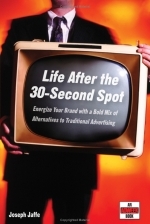 In the book, Jaffe points to ten rock-solid approaches marketers can follow for continued marketing success as the :30 continues to deliver less and less each day. From gaming to on-demand to consumer-generated content to long-form content to experiential marketing and more, Jaffe lays out a clear pathway for marketers to follow when the :30 pathway begins to crumble beneath their feet. Jaffe has split the book into three sections. The first makes a solid argument for why the :30 is and will become a very ineffective ad tactic. The second urges marketers to rethink they way they approach their consumers, their branding, the relevance of their advertising and their ad agencies as they fight for survival against a dying model. Finally, the third section offers the above mention solutions which bring insight and hope to the future of marketing. If you care about your brand, if you care about your clients, if you care about the specific medium in which you work, you must read this book. It will put your mind at ease and give you the motivation to move beyond outmoded thought, long-entrenched paradigms and ineffectual strategies. Most of us know, but I think it�s important to note that Jaffe offered this book to bloggers for free in exchange for a review on the Across the Sound podcast. The result is multiple positive reviews (including this one) for simply the cost of advance copies of this book. With so many thousands of marketing books published each year, it takes folks like Steve Hall and others to add a touch of credibility to stand out from the pack. Jaffe not only wrote a fantastic book, he also exemplified a key PR blogging tactic that we can all take into consideration for future clients. But yes, it is worth noting the promotion.